Home Search and Rescue Coast Guard, fire department rescue 3 people near Kiawah Island, S.C.
Coast Guard, fire department rescue 3 people near Kiawah Island, S.C.
Sep 24th, 2013 · Comments Off on Coast Guard, fire department rescue 3 people near Kiawah Island, S.C.
CHARLESTON, S.C. — Three people aboard a sailing vessel were rescued by the Coast Guard and North Charleston Fire Department Monday at the entrance to Stono River near Kiawah Island, S.C. 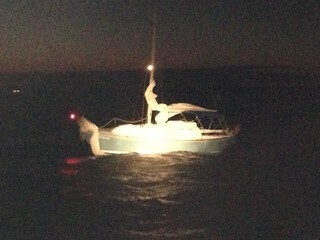 The owner of the 27-foot sailing vessel contacted watchstanders at Coast Guard Sector Charleston via VHF-FM marine radio to report the boat ran aground and that he and two other people aboard were stranded in the breakers near the north shore of Kiawah Island. A crew aboard an MH-65 Dolphin helicopter from Coast Guard Air Facility Charleston launched at 6:58 p.m. and arrived on scene at 7 p.m. Boatcrews from Coast Guard Station Charleston and North Charleston Fire and Rescue arrived in the area about 7:30 p.m. but couldn’t pull alongside the sailboat due to the shallow water depth. A rescue swimmer deployed from the helicopter and transferred all three people to the North Charleston Fire and Rescue boat. The survivors were transported to the Wappoo Cut Boat landing in Charleston. There were no injuries or medical concerns reported. No pollution has been reported from the grounded vessel. The owner of the boat is scheduled to arrange salvage operations for his vessel.